Never before in the history of blogging has there been such a SHOCKING collection of '50s/'60s audio atrocities! You'll flip your wig (or your switchblade) when you...HEAR riotous rock'n'roll and rancid radio ads! HEAR bad-boy bikers blowin' rhythm-and-blues! 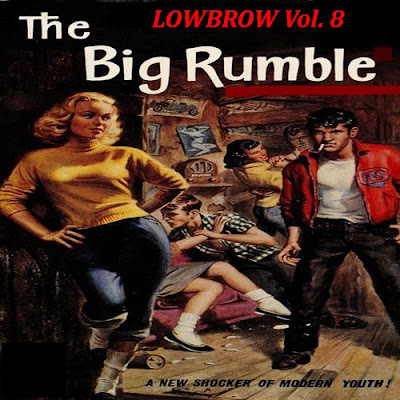 HEAR their rockabilly "rumble" with rival gangs! These heathen hot-rodding hoodlums and harlots are on a one-way drag race to HELL! Music For Maniacs, the blog that brought you such SIN-tillating compilations as "Voodoo Dance Doll," and the banned-in-Boston "Hubba Hubba!," are back with an all-new spine-tingling collection of virgin vinyl rips and recorded-off-YouTube sound selections, many of which have never been digitally available before! There are other similar collections of this sort of teen trash, but these songs have (so far as I know) not been previously compiled. Starring in this festival of forgotten (forbidden?!) 45s: a teen-aged (and unrecognizable) Scott Walker, still going by the name Scott Engel; gay novelty act Sandy Beech; one Mike Minor, possible the only lounge crooner to tackle juvenile delinquency; a Frank Zappa production; both a song by the Cheers (featuring future game show host Bert Convy) and a cover of the Cheers' hit "Black Denim Trousers" (that I think I prefer to the original); Harold Lloyd Jr - yes, the son of the hanging-off-the-clock guy - who had a short, strange life; and since every psychobilly/Cramps-related comp features Link Wray's "Rumble," we're including a different Wray rumbler that might be an even better tune. Volume 7 of our ongoing survey of mid-century sleazy-listening sounds is in limbo - on a hard-drive that has apparently crashed. A drive I bought to be a backup for my main drive! Damn thing (a Passport) is less then a year old. Hoping it can be recovered. So we're jumping to Vol. 8. "Black Leather, Black Leather, Smash Smash Smash! Black Leather, Black Leather, crash crash crash! Black Leather, Black Leather, Kill Kill Kill!" "LOWBROW Vol. 8: The Big Rumble"
1 ad - "The Thrill Killers"
6 ad - "High School Hellcats"/"Hot Rod Gang"
10 ad - "The Wild Rebels"
26 ad - "She Devils on Wheels"
32 ad - "Bury Me an Angel"